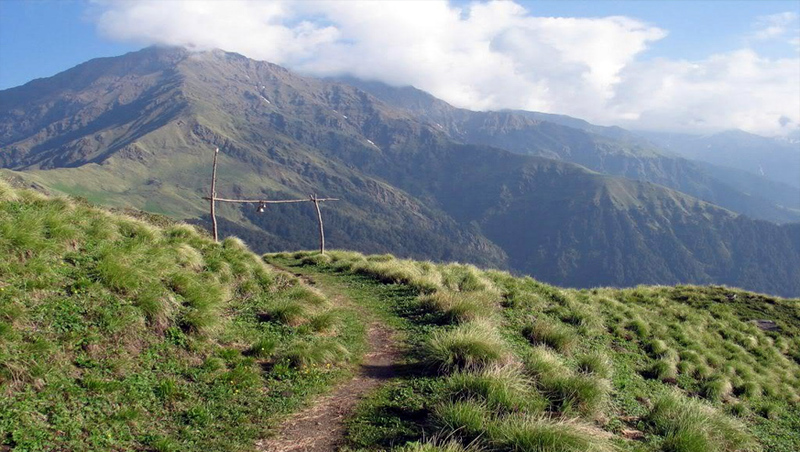 One of the most difficult pilgrimage yatra in India refers to the five temples of lord Shiva in the high Himalaya - kedarnath, Madhyamaheshwar, Tungnath, Rudranath and kalpeshwar which is called Panch Kedar Trek. Panch kedar yatra, panch kedar yatra, panch kedar tour package, panch Kedar tour, travel panch kedar, panch kedar trek, panch kedar trek route, panch kedar photos. It is popularly believed that the Pandavas, after their victory in the Mahabharata wished to pay homage to lord Shiva to atone for gotra hatya – killing their kin, the kauravas. At kedarnath, seeing the Pandavas coming, lord Shiva disguised himself as bull. However the Pandavas saw through this disguise. Realizing that the disguise has not worked the bull tried to thrust itself into the ground. Bhima tried to hold the bull to prevent it from vanishing. In the struggle that ensued, Shiva got torn into separate parts that manifested themselves at various locations in kedarkhand. The forehead appeared at Pashupatinath in Kathmandu; the hump at kedarnath; the torso including the navel at Madhyamaheshwar; the arms at Tungnath; the face manifested itself at Rudranath and the legendary matted locks of Shiva at kalpeshwar. The five sites that fall in India are referred to as Panch kedar. 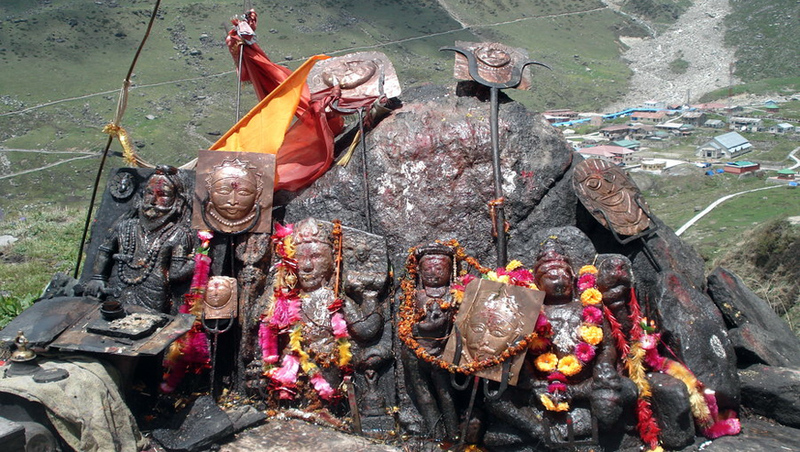 It is held that the Pandavas and their descendents built the temples at kedarnath, Madhyamaheshwar and Tungnath. 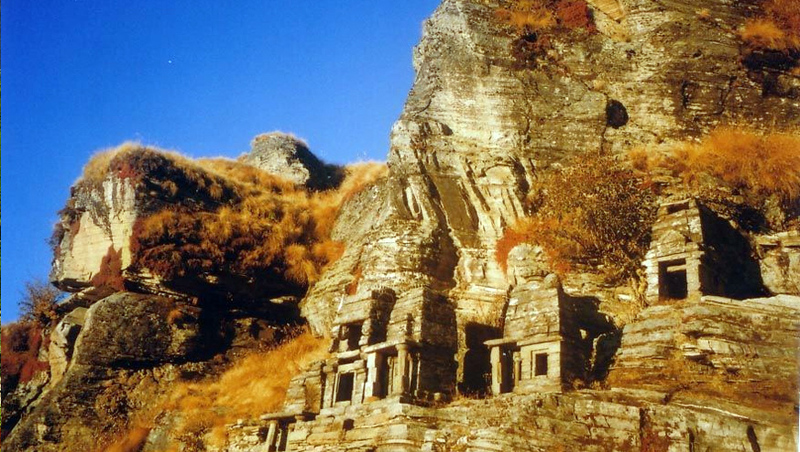 Rudranath and kalpeshwar however remained cave temples. Thats why, Panch Kedar is Popular destination for Hindu Pilgrims. Arrival Delhi Railway Station / Airport, drive straight to Haridwar. On Haridwar, transfer to Hotel. In the evening view Aarti at Holy River Ganges, at Har ki Pauri. Overnight at Hotel. Drive to Gaurikund (a hot water sulphur spring) via Rudraprayag. Check in Hotel. After breakfast drive to Gaurikund (40kms), 14kms trek to Kedarnath. Overnight stay at Hotel. The first destination in the Panch kedar yatra, kedarnath is also one of the char dhams and the Jyotirlinga of Shiva. After breakfast trek down to Gaurikund. Later after lunch drive to Guptkashi. Dinner and overnight stay at Hotel. Trek to Gaundhar with packed lunch. Dinner and overnight in Camps. Trek to Madhyamaheshwar (3289mts) with packed lunch. Dinner and overnight in Camps. According to the legend the torso of Shiva manifested itself at Madhyamaheshwar. In the kedarkhand of Skanda Purana, the mahatm or the significance of the shri Madhyamaheshwar is mentioned. The shrine of Madhyamaheshwar is reach by a trek via Uniana, Gaundhar and Bantoli. Come back trek to Gaundhar with packed lunch. Dinner and overnight in Camps. After breakfast 12kms trek to Jagasu and then 16kms drive to Ukhimath. Dinner and overnight stay at Hotel. 35 kms drive to Chopta and 4 kms trek to Tungnath. In the afternoon return trek to Chopta. Dinner and overnight in Camps. 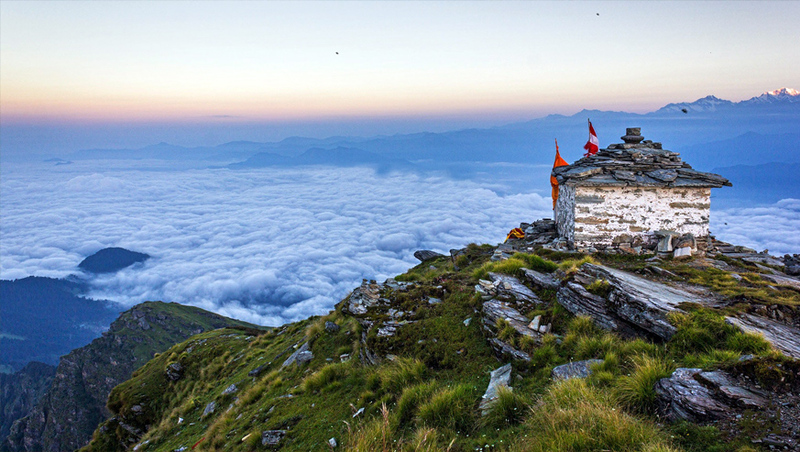 Legend has it that arms of shiva appeared in Tungnath after he took the form of a bull.according to Skanda purana shiva tells parvati that whoever has Darshan and seeks the blessings of Tungnath attains sadgati or spiritual salvation regardless of the place of his death. After breakfast drive to Sagar (30kms). Then 10kms trek to Panargupha. Dinner and overnight in Camps. Trek to Rudranath with packed lunch. Dinner and overnight in Camps. Legend has it that the face of shiva is appeared at Rudranath after he took the form of a bull and tried to escape into the earth. According to Skanda purana mahadev tells parvati that there is a third thirth and which is the best of all pilgrimages and is called Rudranath,pilgrims who comes here with his wish is blessed and all their wishes are granted. Lord shiva is said to reside here perennially. It is believed the ancestors of those who offer pinda tarpan will stay in shivalok till the destruction of the universe. 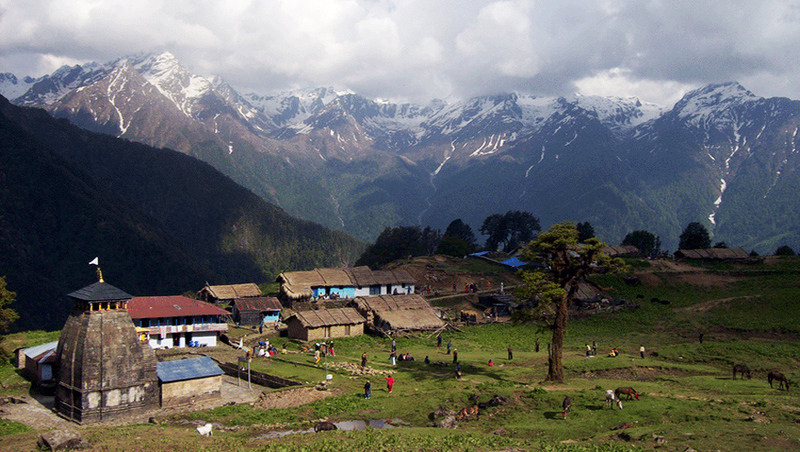 Trek to Dumuk with packed lunch. Dinner and overnight in Camps. 14kms trek to Urgam / Kalpeshwar Mahadev with packed lunch. Dinner and overnight in Camps. After early breakfast trek to Helang (9kms) and then drive to Rudraprayag. Check in Hotel. Drive to Haridwar via Srinagar, Devprayag and Rishikesh. Check in Hotel. After breakfast, drive to Delhi. Drop at Railway Station / Airport.